Pride of Baltimore II is a reconstruction of a Baltimore Clipper, a class of sailing vessels that were the most successful American privateers in the War of 1812. These privately owned ships were authorized by the American government to prey on English merchant shipping, and their success was one of the factors influencing the British to sign the Treaty of Ghent, ending the war. Pride II was built in Baltimore in 1988 based on historic construction details from the early nineteenth century, and has sailed more than 200,000 nautical miles with the dramatic topsail schooner rig preferred by the Baltimore Clippers. 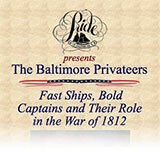 In commemoration of the bicentennial of the War of 1812, Pride of Baltimore, Inc. developed an educational display on the role of privateers in the War of 1812. Funded by the Maryland Heritage Areas Authority, the display consists of 16 units explaining this largely forgotten chapter of the American war effort. 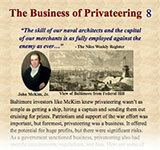 It provides details on the Baltimore-based privateer vessels and their captains, and explores the risks and rewards of privateering as a business for the ship owners. 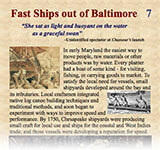 Designed by David MacDonald of the Maryland Historical Society, it is lavishly illustrated using historic images. 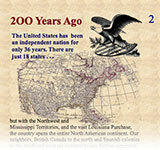 200 years ago, the young United States consisted of only 18 eastern states, but was starting to expand westward after the Louisiana Purchase. Native Americans resistance was thought to be encouraged by the British in Canada. By 1812, Napoleon had conquered much of Europe, but Britain’s strong navy prevented a French invasion. 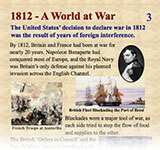 Both Britain and France blockaded neutral shipping to their enemy, crippling the American ports and trade. British navy captains stopped American ships on the high seas and “impressed” Americans to serve unwillingly on British ships, leading to calls for war. 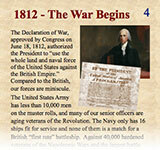 President Madison called on Congress to declare war on Britain in June, 1812, in spite of the weak American navy. From the outset, the Americans planned on utilizing the ancient practice of privateering, commissioning privately owned vessels to capture enemy merchant ships for profit. While pirates have become romanticized and idolized by the media, historically they have been nothing more than sea-going robbers. 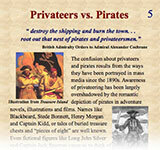 Privateers, in contrast, were legally commissioned by their governments to capture enemy vessels only in wartime, and American privateers were held accountable to rules limiting their activities. 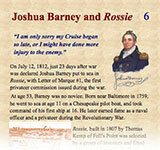 Baltimorean Joshua Barney was one of the first American privateers to act in the War of 1812. A veteran naval officer and privateer in the Revolutionary War, Barney’s four month privateering cruise along the East Coast and Caribbean in 1812 resulted in 20 captures worth more than 1.5 million dollars. Baltimore became a center of privateering in 1812 due to its history of shipbuilding for the Chesapeake Bay. In contrast to the rugged sea conditions of northern Europe, the Chesapeake fostered the design of fast and maneuverable schooners suited to its mild winds and narrow channels. In the hands of skilled captains, these ships could easily out sail the British navy ships sent out to catch them in the Atlantic. Privateering vessels like the Baltimore Clippers were owned by businessmen who wanted to make a profit from financing the construction and outfitting of a suitable ship. They were required to post a bond with the government to ensure compliance with privateering laws. 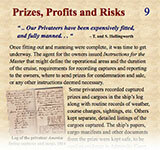 Owners and crews were paid only if their ship captured legitimate “prizes”. Since captains were required to record details of their captures, historians have been able to show that privateering was a risky business. While a few ships and captains earned a profit for their owners, most did not. One problem was that after capturing a prize, it had to be sailed to an American port for legal sanction as a prize, and some captured prizes were recaptured by British navy ships before reaching port. 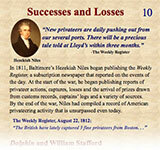 Much of our history of American privateers in the War of 1812 comes from the newspaper Weekly Register published by Baltimorean Hezekiah Niles. These accounts show that many American privateers returned home without even sighting a British merchant ship, others were captured by the British, while others were lost at sea. 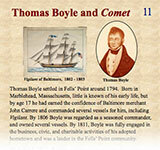 Thomas Boyle was the most famous Baltimore privateer captain. A successful merchant captain before the war, Boyle was hired to command the Baltimore schooner Comet as a privateer in July, 1812. His first cruise lasted three months and resulted in four prizes his crew sailed to the US and sold for a handsome profit. By 1813 the British were able to free up some ships and men from the conflict in Europe, some of which were sent to the Chesapeake. 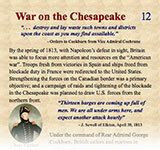 The Royal Navy raided Chesapeake towns for supplies and fought skirmishes with local militia, culminating in the burning of Washington in August, 1814. 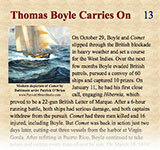 Captain Thomas Boyle commanded the Baltimore schooner Comet on two more privateering cruises, largely in the Caribbean. Although he could out sail the British pursuing him, most of the merchant ships he captured were recaptured by the British. In July, 1814, Boyle took command of a larger Baltimore Clipper termed Chasseur, whose privateering success brought her renown as the “Pride of Baltimore”. After the British easy success in destroying the young American capital of Washington, an obvious next target was Baltimore, the third largest city in the country, and a center of privateering. Troops marching on the city encountered well-organized resistance, and strongly fortified Fort McHenry withstood heavy naval bombardment, leading the British to abandon the attack and giving us the Star Spangled Banner. Captain Thomas Boyle’s privateer Chasseur cruised British home waters in the summer of 1814, capturing prizes and frustrating their Royal Navy pursuers. Chasseur home in the fall, but in December set out on a winter cruise of the Caribbean. Eight prizes were captured before Chasseur battled and beat a stronger British schooner sent out to pursue American privateers. 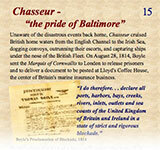 Chasseur had a triumphant return to Baltimore in March 1815 after learning about the end of the war. With the end of the war, privateer vessels needed to find a new business plan, but their limited cargo capacity meant they couldn’t compete with slower, wider, merchant vessels. Baltimore clippers became privateers for emerging South American nations, smugglers running opium from China, and in the illegal transport of slaves. However, since they were not built for durability, few remained after 1830. This project was supported by a grant through the Maryland Heritage Area Authority. Concept and research was conducted by Pierre Henkart. Text and graphic design is credited to David McDonald.